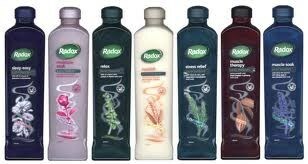 Radox is a brand of bubble bath and shower gels available in the United Kingdom, Ireland, Czech Republic, Australia, Malaysia and South Africa. It comes in both bath salt and liquid form. Unilever agreed to buy the brand from Sara Lee in September 2009.